In a large pot of boiling water immerse the eggs and cook for 10 minutes. Take out the eggs and immerse them in a bowl of cold water. Mix together in a bowl with a lid the soy sauce, garlic, ginger, cinnamon, honey, water and oil. Remove the hulls from the eggs and prick them on all sides with a fork. Put the eggs in the bowl with the sauce mix and cover. Marinate in the fridge for at least 2 hours, turning the eggs several times. Heat a wok over medium heat and put the eggs and marinade to cook together, gently stir until the marinade evaporates, being careful not to burn. Let cool a little then cut the eggs in halves. Remove the yolks and put them in a bowl. In this bowl add mayonnaise, chopped chives, paprika, salt and pepper. Mix and fill the egg whites. 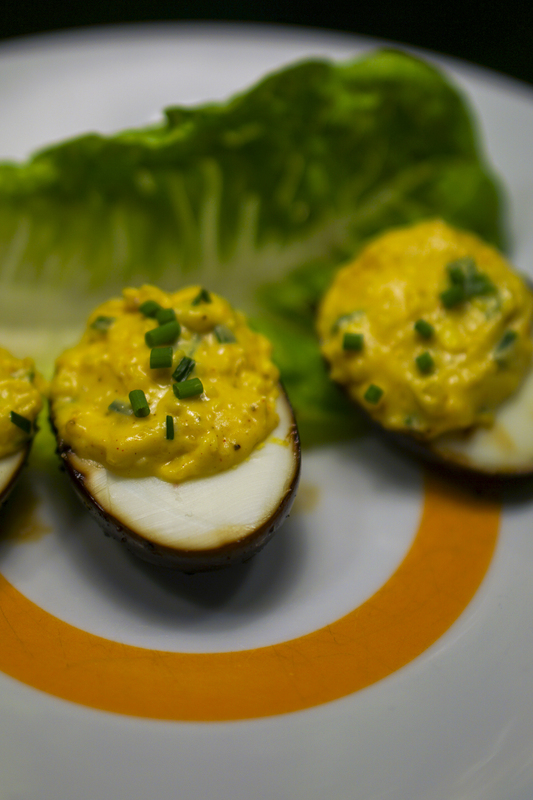 Serve your roasted mimosa egg as an appetizer.